After The Woman in Black put Hammer films back on the map, the horror studio plans to follow up its success with a sequel. Based on another story by Susan Hill, The Woman in Black: Angels of Death will be developed by screenwriter Jon Croker, and will return 40 years later to the same Eel Marsh haunted mansion as the previous film. Seized by the government and converted into a military mental hospital during World War II, the sudden arrival of disturbed soldiers to Eel Marsh House has awoken its darkest inhabitant. Eve, a beautiful young nurse, is sent to the house to care for the patients but soon realizes she must save them from more than their own demons. 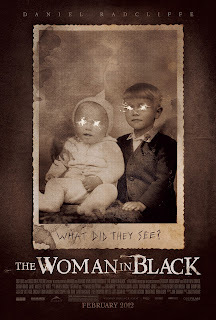 Despite Eve’s efforts to stop her, one by one they fall victim to The Woman in Black. Even thought the sequel would feature a new cast and plot, Bleeding Cool reported that Hammer CEO Simon Oakes hoped to bring Daniel Radcliffe back for a small role. As if you needed more vague hinting, Oakes said Radcliffe "might" appear.